Who I look up too…. What’s in your basket this Easter? Here are some great examples of candies for the kids (or adults) in your home that have food allergies or sensitivities. 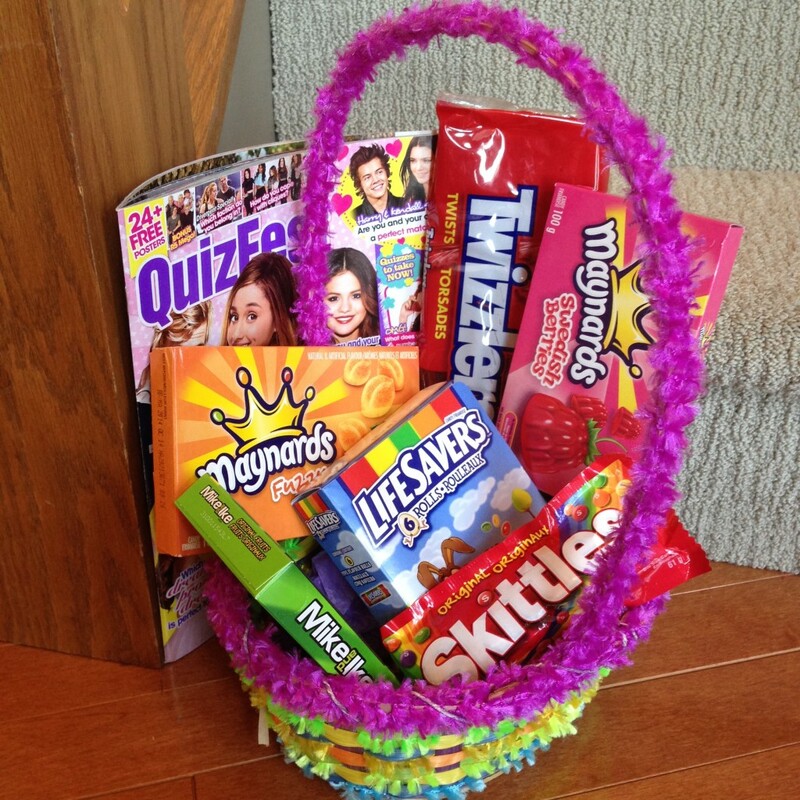 It doesn’t have to be chocolate, the Easter bunny can make up fun baskets that they’ll love. Along with some of these candies, an itunes card, a cute stuffy, some magazines, even some spring nail polish for the girls can be added. For the boys, also an itunes card, some hockey cards and some mini lego sets work well. The kids are getting older but we still enjoy having an easter egg hunt in the morning. The chocolate eggs are around but so are the colorful plastic eggs that you can open and find some allergy-friendly candies too. Have a Happy Easter weekend with family and friends…. Most of our dishes during the day go into the dishwasher, especially with three young kids. Some dishes though I do hand wash, like the pots and pans, cause usually they need a little more scrubbing. When hand washing in the sink I tend to sort, probably don’t have too. I always leave the frying pan full of scrambled eggs and pots that had fettuccini alfredo cooked in them to the last. There are some good suds going in the sink but I still think of cross contamination of foods. I don’t want to wash say the frying pan first and get all that egg residue from the pan in the washing water. Do you sort or just throw in all the dishes into the sink and wash in no particular order? It’s great to see that my daughter is getting so much out of her first semester of cooking in Home Ec class. Just because she has multiple food allergies does not stop her from getting in there and preparing food and cooking with her group. It is actually a very important class for a young allergic child, in that they definitely need to know their way around a kitchen and how to cook. Food preparation is a very key element for kids with food allergies. As they get older they will be cooking more for themselves instead of their parents always making their meals. The first day I went in and spoke with the Home Ec teacher and filled out a form about my daughters allergies and what she cannot eat. She told me that she needs to bring in her purse to each class that contains her epi-pen and asthma inhaler, not to leave in her locker. Also that my daughter and her will monitor what she can and cannot taste test, which is probably not much. She is allergic to dairy, egg, peanut and tree nuts so its pretty limited with what they will be making. My daughter has come home excited though and talked about the food that they made that day. Each child contributes making the recipe of the week. My daughter knows as long as she washes her hands frequently and does not taste test the food, all is good. So if they were to be frying something like eggs that day, she would contribute by measuring other ingredients. She knows not to stand over the stove while frying eggs as that may cause an asthma attack for her. She can crack the egg but must wash her hands thoroughly with soap and water right after. Even though she can’t try the food in the end, she is still having fun and staying safe. It’s all about inclusion and not making kids feel left out. Some days we are running around with one kid here and the other kid there. Then we get home, once everyone is picked up, and it’s like “What’s for dinner?” Usually there is some leftovers to put together or something in the pantry for the kids. What about the allergic child though? not so easy. I have to tell you, these nights are not my favorite as I stress about what to bring to the table. I can feed my other two whatever, but my third I actually have to think about the ingredients and it usually has to be homemade…aaaahh. No drive thru’s on the way home, well I guess I could for the other two but then I feel bad for my daughter who can’t just order from any drive thru window. Thankfully…if it is a leftover night it would be some kind of casserole in the fridge that is actually full family friendly, so whew. If its hey, “what’s in the pantry?” then a little more creativity is needed and that’s when the pasta noodles and sauce come in handy. I have to say though my daughter’s favorite, other than pasta, are wraps where you can just add meat, veggies and salsa. Tell us, “What are some of your quick go too’s for those last minute allergy-free meals? I enjoyed the holidays with my family and friends, visiting and of course eating lots. The kids were glad to have a good long break from school. On the food front, there was only one accidental allergen exposure. My daughter had some yummy homemade turkey soup, low and behold her mouth ended up getting all tingly and itchy. Hmmm…what could it be?…Oh you fried the vegetables in a bunch of butter before putting in the soup….really. When you don’t deal with food allergies in your home on a daily basis, something like this you wouldn’t even realize, oh yeah the butter has dairy in it. It was all good, but would of been nice to know that beforehand. I did ask if the pasta was egg-free and just assumed the vegetables were just thrown in and simmered with the soup. Another gentle reminder of checking the ingredients and not assuming it’s all good to go. Well looking forward to the New Year and keeping up with the allergy information and would love to hear some feedback or stories from my allergy friends. Canadian pediatricians and allergy specialists are now saying that there is no need to wait to feed your baby potential food allergens. 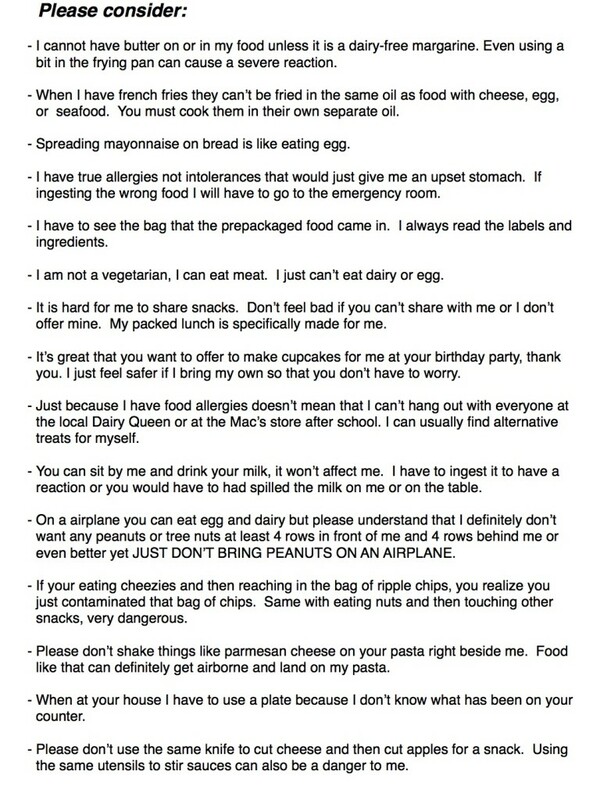 I totally agree with this, only though if you do not have a family history of food allergies or asthma. You definitely try either way your kid will be allergic or not allergic doesn’t matter if you wait. I ate lots of eggs and peanut butter while pregnant with my first child. I then breastfed for 7 months. My daughter is very allergic to both and it showed up even before the 6 months in the way of eczema. During my second and third pregnancy I stayed away from eggs and all nuts and my other two are not allergic to either. I think in a way they are already preprogrammed on their sensitivities and then environmental exposures will then contribute along with the different ways food is processed these days. I think we just need to cook and eat like our grandmas use to feed us…completely homemade-no prepackaged foods. “May Contain” or Does It? So food producers out there, us allergy-free people need to have the appropriate labelling on products at the grocery store. It gets really confusing for someone that has bought a certain product for years and then all of a sudden it may contain all these ingredients. Did you change the production line by adding more products that would contain allergens or did you change your recipe for that certain product or did you just change your branding packaging? Let us consumers know. I am so grateful for all the labelling legislation in the last few years, it is very much needed for making choices on purchasing food products. Today food allergies and intolerances are at a high and are still growing. As consumers, we definitely need to know what exactly is in your food product on the shelf because that is our deciding factor when buying food not the price. What are the ingredients and can my family eat this? I am worried though that companies may end up over labelling, just for their own companies protection. I can understand you are worried if anyone happens to react to your product you can say that it is right there on the side of the box. For my daughter, she has limited off the shelf food products that she can buy. If everything is labelled with an allergen may contain label, it gets confusing on what is safe and what may not be. There are certain foods we have been buying for years that all of sudden are now labelled, so do we still buy it knowing she was fine with it before the label? With technology these days your company can easily make a note about a product labelling change so we can know the reasoning for the change as consumers. Every time I go to the grocery store I still read the side labels, even though I have bought it many times before. Luckily us allergy-free ingredient watchers always look at labels every time. Today is my daughters 12th birthday. For her though I can’t just run out and buy a cake at the bakery as she is allergic to dairy, egg, peanut, tree-nut. So I always make her a nice cake, we have done everything from hello kitty to spongebob to just plain chocolate cupcakes. She wanted this cake for tonight after supper. Cream together butter, oil, sugar, egg subst, and then add rest of ingredients. Mix well and add to a bundt pan or 9×13 pan. Bake at 350 for 45 min or when toothpick comes out dry. You can add icing or a dairy-free icecream to top off, but its good by itself too. Seriously…how many times do I wash my hands in the morning while making breakfast and the kids lunches for school. You have the eggs, cheese, butter, breads, yogurts, and the milks. Only if my utensils could talk, they would remind me where they have been, as I’m in my morning brain fog. Kinda of jealous of those who can just make whatever and not have to think of, this can’t go with that or that can’t go with this. If you mix up lunches and put the wrong lunch kits in the wrong backpacks, no worries. I have actually got a phone call once from my daughter saying that she has bitten into the wrong sandwich, that it had cheese. Thank goodness she recognized right away and only had to follow with some Benadryl. Every family has their morning routines and for our family we work together in the kitchen and keep cross contamination between foods at a low minimum. And wash our hands lots…lol.